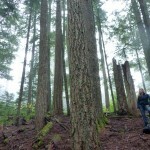 It’s a foggy fall morning, and University of Washington researcher Susan Dickerson-Lange pokes her index finger into the damp soil beneath a canopy of second-growth conifers. The tree cover is dense here, and little light seeps in among the understory of the Cedar River Municipal Watershed about 30 miles east of Seattle. She digs a small hole in the leaf-litter soil, then pushes a thumb-sized device, called an iButton, about an inch beneath the surface. If all goes well, this tiny, battery-powered instrument will collect a temperature reading every hour for 11 months. Researchers hope this tool and a handful of other instruments will help them map winter temperatures throughout the watershed as they track snow accumulation and melt. This fieldwork piggybacks on a recent finding by Jessica Lundquist, a UW associate professor of civil and environmental engineering, and her lab that shows that tree cover actually causes snow to melt more quickly on the western slopes of the Pacific Northwest’s Cascade Mountains and other warm, Mediterranean-type climates around the world. Alternatively, open, clear gaps in the forests tend to keep snow on the ground longer into the spring and summer. Lundquist and her colleagues published their findings online this fall in Water Resources Research. (left to right) UW civil and environmental engineering researchers Nicoleta Cristea, Brian Henn and Susan Dickerson-Lange use an antenna and GPS to precisely track plot sites in dense, second-growth forest in the Cedar River Municipal Watershed. 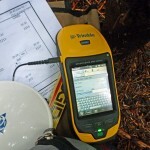 UW civil and environmental engineering researchers set up instrumentation in an old-growth forest plot within the Cedar River Municipal Watershed east of Seattle. A variety of instruments will help measure snow in this area once it starts to fall. Their research looks at the effects of tree cover and open areas on how long snow stays on the ground. A researcher downloads data onto a laptop at one of the gap sites. Snowfall in a thinned part of the forest. 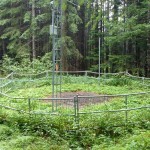 A snow monitoring station in a cleared area in the Cedar River Watershed. Tiny iButton sensors with protective shields are placed high up in the trees at various sites to measure air temperature in the forest. This funnel protects an iButton sensor that is placed in a tree to measure air temperature. Brian Henn buries an iButton sensor in the ground at a study plot site. The small device will record temperature readings every hour for 11 months. 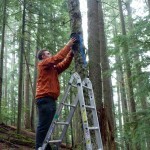 Brian Henn places a hunting camera on a tree in an old-growth plot in the Cedar River Watershed. The camera will help track snowfall. Forest managers have thinned and cut gaps in dense, second-growth forests to try to encourage more diversity that resembles an old-growth forest. 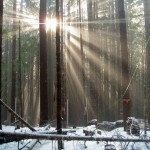 UW researchers have found that snow lasts longer in open areas than in the forest. 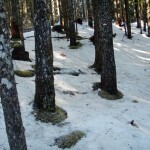 Snow is melting around the base of these trees in a dense, second-growth forest. Nicoleta Cristea and Brian Henn take a GPS reading at a thinned forest plot. 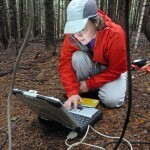 Susan Dickerson-Lange downloads data onto her laptop from a weather station located in dense, second-growth forest in the Cedar River Watershed. Water from the Cedar River Municipal Watershed serves about 1.4 million customers in the Seattle area. 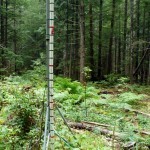 Time-lapse photos of this measuring pole in a forest gap site will track total snowfall in this area. Researchers snowshoe in to a study site. 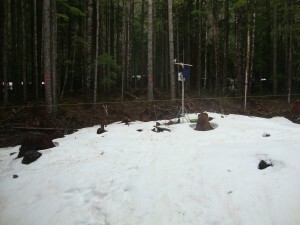 Snow covers the ground and instruments in an open gap site in the watershed. 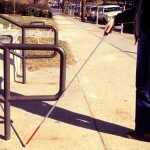 Common sense says that the shade of a tree will help retain snow, and snow exposed to sunlight in open areas will melt. This typically is the case in regions where winter temperatures are below freezing, such as the Northeast, Midwest and most of central and eastern Canada. But in Mediterranean climates – where the average winter temperatures usually are above 30 degrees Fahrenheit – a different phenomenon occurs. Snow tends to melt under the tree canopy and stay more intact in open meadows or gaps in a forest. This happens in part because trees in warmer, maritime forests radiate heat in the form of long-wave radiation to a greater degree than the sky does. Heat radiating from the trees contributes to snow melting under the canopy first. 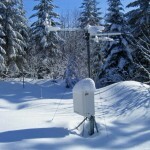 For the study, Lundquist examined relevant published research the world over that listed paired snow measurements in neighboring forested and open areas; then she plotted those locations and noted their average winter temperatures. Places with similar winter climates – parts of the Swiss Alps, western Oregon and Washington, and the Sierra Nevada range in California – all had similar outcomes: Snow lasted longer in open areas. 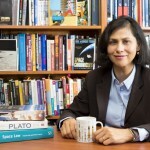 “It’s remarkable that, given all the disparities in these studies, it did sort out by climate,” Lundquist said. Even in the rainy Pacific Northwest, we depend on yearly snowpack for drinking water and healthy river flows for fish, said Rolf Gersonde, who designs and implements forest restoration projects in the Cedar River Watershed. Reservoirs in the western Cascades hold approximately a year’s supply of water. That means when our snowpack is gone – usually by the summer solstice – our water supply depends on often meager summer rainfall to get us through until fall, he said. Snowpack is a key component of the Northwest’s reservoir storage system, so watershed managers care about how forest changes due to management decisions or natural disturbances may impact that melting timetable. 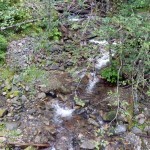 The UW’s research in the watershed has been a beneficial partnership, researchers say. The 90,000-acre watershed is owned by the City of Seattle and provides drinking water to 1.4 million people. 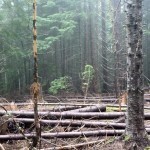 The area now is closed to recreation and commercial logging, but more than 80 percent of the land was logged during the early 20th century, and a large swath of dense, second-growth trees grows there now. Watershed managers have tried thinning and cutting gaps in parts of the forest to encourage more tree and plant diversity – that then leads to more diverse animal habitat – offering the UW a variety of sites to monitor. The UW researchers acknowledge that temperature is a very broad predictor of snowmelt behavior, yet they expect their theory to hold true as they look more closely at the relationship between climate and snowmelt throughout the Pacific Northwest. 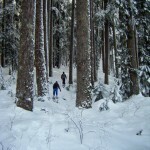 They are collaborating with researchers at Oregon State University and the University of Idaho, and are ramping up a citizen science project asking hikers and snowshoers to share snow observations. Co-authors of the recent paper are Nicoleta Cristea of UW civil and environmental engineering and James Lutz of Utah State University. Funding for the research is from the National Science Foundation. For more information, contact Lundquist at jdlund@uw.edu or 303-497-8257 and Dickerson-Lange at dickers@uw.edu or 253-225-9909. Lundquist is on sabbatical but is reachable by email or phone.